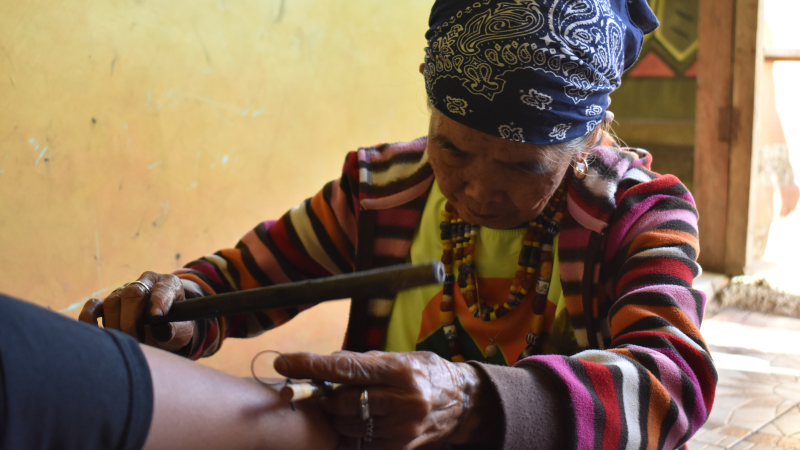 Apo Whang-Od Oggay is a ButBut tattoo artist a mambabatok, and is one of the oldest villagers in Buscalan. Located in Banaue, Ifugao province in the Philippines, Buscalan is completely cut off from the rest of the world in terms of modern or even moderately passable roads and even telecommunications, and yet, foreign and local tourists continually brave the 19-hour journey and one-hour hike up the ancient Kalinga hillside to see her – and have their skins permanently tattooed by the wizened tattoo artist. Whang-Od’s reputation as a tattoo artist has gone beyond the boundaries of Buscalan – and the Philippines – a long time ago. Her designs, which she often chooses herself for specific clients, are not originally meant as tourist attractions. She explains that for the ButBut tribe, the tattoos are meant for blessing and protection. Ancient ButBut warriors get tattooed after their first kill. ButBut women adorn themselves with fertility symbols to beautify themselves. The blessing and protection are placed on the skin itself – so that the wearer will always be protected and kept safe from harm. When international and local tourists began braving the trek to their village to pay 500 pesos for a chance to be tattooed by the renowned tattoo artist, Apo Whang-Od wasn’t exactly resistant to the idea – she thought of it as a fair exchange, as in – if the ButBut can have protection brought by the tattoos, then why not other people? To the wizened old woman who stood at less than five feet, the activity was not cultural appropriation. Her reputation has created an industry in the Buscalan village itself, and has generated jobs for other families. What happens after she passes is another thing altogether. Her great, grand-nieces mark those who cannot be seen by Whang-Od anymore, and they pay close attention to everything she says, and everything she does. Soon enough – her great-grand nieces will have to take the helm of Apo Whang-Od, not just for their family, but for the entire village of Buscalan. On February 2018, the Philippine Senate adopted a resolution declaring Apo Whang-Od Oggay Gawad sa Manlilikha ng Bayan (National Living Treasure). WeChat, or Weixin in China, is being evolved to become Facebook’s biggest rival in providing consumer communication and value-added services via the mobile app.